Deftones have shared a number of Instagram posts confirming they’re together and working on new material. A total of four images have appeared on the band’s account revealing that they’re in Sacramento, California, working through ideas which are expected to appear on the follow-up to 2016’s Gore. 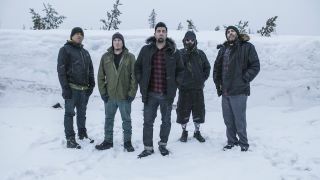 Speaking back in May this year, Deftones frontman Chino Moreno said the material they were working through was sounding “powerful”. He told Argentinian website Rock.com: “There are six or seven songs which are still mutating. They are very powerful and I am anxious because it’s been a collaborative process. “I think all of our albums were postcards of what we were going through at each moment. With 1995 debut album Adrenaline, we were boys, while 2000’s White Pony, we had matured a little. Everyone has their own feelings, because it belongs to an era. Deftones recently played the Robert Smith-curated Meltdown festival in London and have two more live shows planned later this year. They’ll take to the stage at the Aftershock festival on October 13 in Sacramento and play at Dia De Los Deftones 2018 in San Diego on November 3.